During the 80’s businesses analyzed their operation for sustainable growth. They grew tired of the boom/bust cycle, resource wasting, and environment polluting ways of the past. A new philosophy of resource sparing, efficient, slow but consistent growth emerged that left both the business and the environment healthier. Taking a lesson from this can you say your fitness level year over year has seen an improvement? Are you healthier, leaner, and more muscled each and every year? Has the last decade been one of improvement or decline? If you can’t say that, like the Oil of Olay commercial, you are not getting older but better you need to adapt sustainable growth principles for fitness. The above 3 are basic and linked together. Two years ago I needed to hire a male fitness model to demonstrate a new chin up bar. At that point I decided that, although 48 years old, my body would improve to the point I could replace the model. 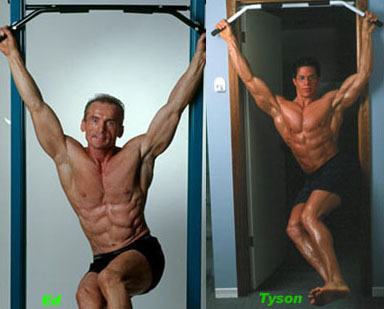 You see pictured Tyson Mount, personal trainer at 25 years of age and myself Ed Szczepanik, EasyEffort president at 50 years of age. How does a 50-year-old businessman compete with a man half his age in body development? First of all you must manage your time properly. That means finding time to exercise. This was simple for me. There were and still are only 2 windows of opportunity for me to exercise. Working full time and starting a new business filled my days. So getting up an hour before having to head to work to exercise was my only weekday window. On the weekend I could sleep in an hour or so but 1st thing in the mornings on weekends was my second window for working out. Before you say that this is too early, I needed to be at work for 6:00 a.m. This meant waking up at 4:15 a.m. to work out, shower and head to work. Morning workouts make sense for a variety of reasons. You are freshest with your energy and testosterone levels the highest. This has to be the best way to start your day unless of course you can entice your spouse into some bedroom aerobics. Next on the list of time management tools is some home exercise equipment. Now don’t get me wrong about health clubs. They are great and provide a variety of equipment choices. I just do not know anyone who is in shape who does not spend some of his workout time at home. The time spent driving to and from a gym, changing clothes, waiting for equipment, etc. could be better spent. Next time you peel your clothes off heading for a shower at home stop and bang out 5 sets of chin-ups to failure. The pump in your back, shoulders, and arms will make your shower feel even better. Your total investment for this pump will be 6 to 8 minutes of your time and about $30 to $60 for a chin up bar. #1 - The largest muscle group is worked at the beginning of the week. #2 - At each workout the largest muscle group must be worked first during the session. #3 - Each workout session must not exceed 45 minutes in duration. By working the largest muscle group the first of the week guarantees you have spent your energy on stimulating muscle growth on the largest amount of body muscle. If you end up running out of gas before the end of week that first major workout is in the bank. When you start each session with the largest muscle group for that day’s workout the above analogy also holds true as well. For example if you start #1 workout for the week with dead lifts even if you do nothing else the rest of the week you have gone a long way in working your entire body. Now lets say your #2 workout consist of chin-ups, standing presses, and side laterals. 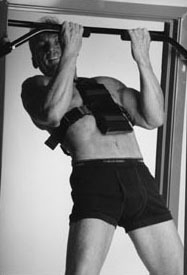 It is obvious that chin ups work more muscle the standing presses as do the presses work more muscle than laterals. So the lesson is focus on the basic compound heavy movements. The other movements are added if you have the energy. This brings us to exercise selection. As you see from the above, compound free weight moves are preferred. Let me give you my pecking order for exercises. 1. Free weight compound joint exercises that move the body through space. I know of only 5 such moves and they are dead lifts, squats, chin-ups, parallel bar dips and push-ups. 2. Free weight compound joint exercises that have the body fixed e.g. overhead presses, bent over rows, bench press. 3. Free weight single joint isolation exercises e.g. side dumbbell laterals, hammer curls, triceps lying French curls. Most people would improve their builds tremendously if they dropped exercises in-group 2 and 3 in favor of group #1. Below is my three-day a week resistance training routine that incorporates the above time, energy and exercise selection principles for maximum benefit. Lying triceps French curls 35 lbs. 5 to 8 reps. The above cycle is repeated 5 times in a non-stop fashion. Side Laterals 10 lbs. 5 to 8 reps.
either incline Bench Flies or incline Bench Presses about 35 lbs. 5 to 8 reps followed directly by Hammer Curls 20 lbs. 5 to 8 reps.
Notice how drastically the weight drops in exercise #2 and #3. #1 exercise is the heaviest while #2 and #3 allow total body recuperation while still working smaller muscles. That is why you can proceed non stop. I set an egg timer for 30 minutes to complete the cycle 5 times. So there you have it 1 & 1/2 hours per week of resistance training at home with minimum investment of time and money. Dead lifts, chin ups and dips are tough so start slow! The above three moves will do more for you than twice that amount on gym isolation machines! Easyeffort maintains a manufacturing facility in Leamington, Ontario, Canada. DISCLAIMER: Easyeffort products have been manufactured and tested to decrease risk of injury. However, the user assumes all risk of injury in the improper use of these products. Please consult your physician before starting any exercise program. If you experience any discomfort while using these products, discontinue use and consult your physician immediately. © 2019 Easyeffort. All rights reserved.